Hanoi (VNA) – Politburo member Nguyen Van Binh, head of the Communist Party of Vietnam Central Committee’s Economic Commission, received a delegation of the German parliament’s Budget Committee in Hanoi on March 27. The host welcomed the working visit by the delegation, led by Andreas Mattfeldt – parliament member of the ruling alliance of the Christian Democratic Union (CDU) and the Christian Social Union in Bavaria (CSU) of Germany. He said the trip is made amid the increasingly intensive and substantive strategic partnership between Vietnam and Germany. 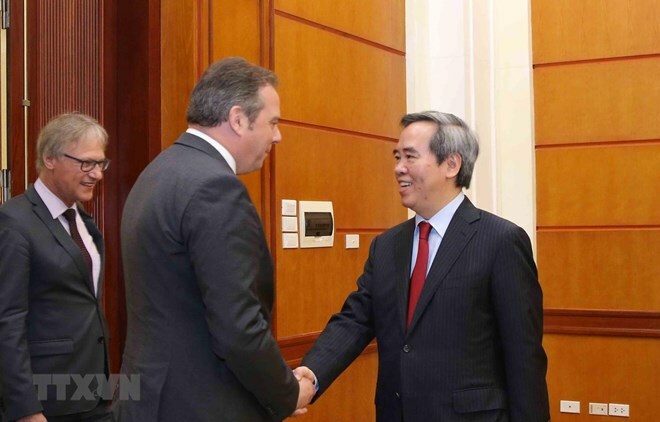 Binh affirmed that the Communist Party of Vietnam always prioritises the traditional cooperation and friendship with Germany and its political parties. He appreciated Germany’s precious and effective assistance for and cooperation with Vietnam, noting that Germany is now the biggest trade partner of Vietnam in Europe with bilateral trade surpassing 10 billion USD in 2018, up 1 billion USD from the previous year. Vietnam hopes that Germany and other members of the European Union (EU) will support the EU-Vietnam Free Trade Agreement, he said, adding that the early signing and ratification of this deal will bring numerous cooperation opportunities to both countries, not only in trade and investment but also other aspects like vocational training, renewable energy, digital economy, healthcare, education, political, and security-defence. He asked the two sides to coordinate closely to turn these opportunities into concrete and fruitful cooperation projects, thus generating practical benefits for businesses and people of both countries. For his part, Mattfeldt spoke highly of Vietnam’s recent socio-economic development attainments.